Michelle Mismas of All Lacquered Up was the original nail blogger. She boasts an encyclopaedic (that’s meant to be pronounced in the same manner as HIMYM‘s Ted Mosby says it) knowledge of polish and color and especially green iterations. And I am loving her collaboration with Sally Beauty brand FingerPaints, called A Pair Affair by All Lacquered Up. 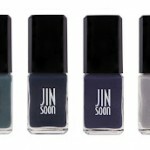 It features six trendy but wearable shades ranging from a glittering teal to an unbeige beige, infused with sparkle. The duos are as follows. $6 each, available at Sally Beauty and sallybeauty.com in September. What’s On Michelle Mismas’ Vanity?